From the beginning, music has been central to the worship of Grace Church, particularly the organ and the choirs. The principal function of our organist and choir director, as well as the organ at Grace, is to lead our congregation in singing hymns, to accompany our choirs, and provide opening and closing voluntaries for services. The choir's principal function is to lead our congregation in singing hymns and chants, and to present various sacred texts in anthems at the Offertory and during Communion. The style of music at Grace is traditional but not stiff, and the music we prepare represents the best of the historic Anglican tradition while also including music of recent provenance. Our emphasis is always on the Scriptural and liturgical text, appropriateness to our worship (Holy Eucharist, Rite II and the Revised Common Lectionary) and our effort to provide a worshipful musical presentation of our several texts. Mary C. Baas, is Organist and Choir Director. She holds the Bachelor of Arts degree from Calvin College and served as Director of Music at Holy Cross Episcopal Church in Kentwood before coming to Grace. We are very pleased to have called Mary to serve as our new organist and choirmaster, especially in view of her talents and gifts, which she has been so willing to offer on behalf of our parish and minstry. John E. Hamersma is the Director of Music and Organist at Grace Church, Emeritus. He holds the Doctor of Sacred Music degree from Union Theological Seminary in New York City and until his recent retirement served as Professor of Music and College Organist at Calvin College in Grand Rapids, Michigan. He served as Director of Music for the Sunday services at Union Theological Seminary in New York City from 1957-1960, directing a fully professional choir. He has also served churches in New Jersey, Michigan, and Germany. The Grace Church Choir leads the congregation in worship and enhances the liturgy of the church through choral music. The choir sings for the 10:00 a.m. service each Sunday morning from the Sunday after Labor Day through Pentecost. In addition, the Choir leads in worship at 4pm on Christmas Eve, on Maundy Thursday evening, at the Good Friday noon liturgy, and on Easter morning. Anyone interested in singing with the Grace Church Choir is welcome to join us on Thursday evenings at 7pm and Sunday mornings at 9am. The only requirements are a commitment to enhancing our worship through music and the ability to carry a tune on pitch. Do join us for a season of growth in community, faith, musicianship, and worship with people of all ages. Membership does not require a musical background or a solo voice and there are no auditions. Our children’s choir is a ministry to first through ninth graders. This ministry is intended to give children the opportunity to grow in the love of Jesus by means of education, fellowship and music. It also provides a time of learning in which our children learn to lead our congregation in Episcopal worship. In this way, the Choristers program is not only a ministry to our children but also a ministry by our children to the parish. Choristers participate in the 10am service once each month and at special services throughout the liturgical year. The Choristers rehearse Sunday mornings, September through May, from 9:15 to 9:45am in the Undercroft. The weekly rehearsals engage the singers in active and fun-filled warm-up techniques and a varied repertory of sacred songs for children. The children learn the various parts of the service, both in song and word, not only to act as leaders in worship, but also to aid in their own understanding of worship. 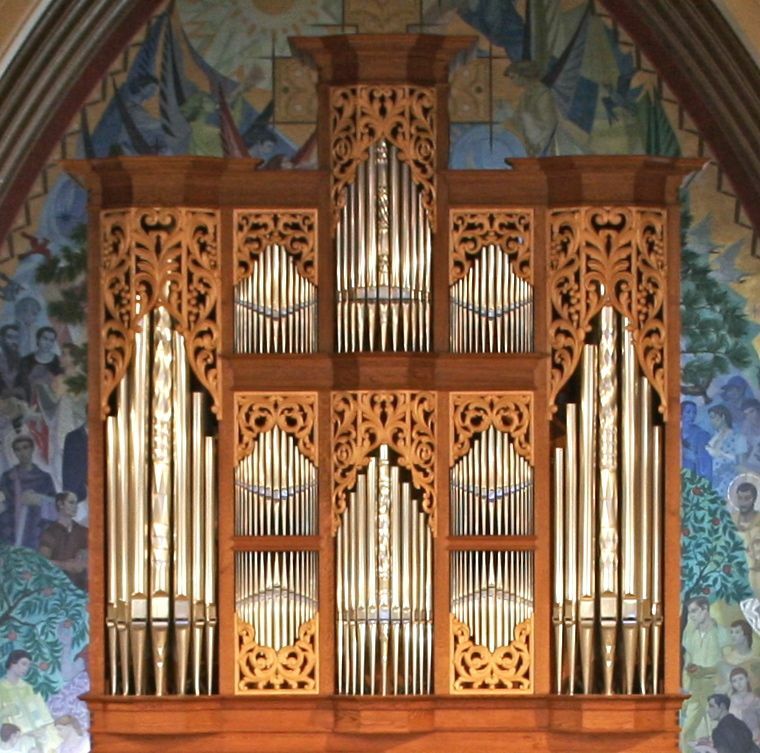 The Grace Church Organ was built in 1981 by Fritz Noack of Georgetown, Massachusetts. It consists of 40 stops on three manuals and pedal. The instrument is a “tracker” and has an entirely mechanical action, judged to be the most reliable and durable of organ actions. Tracker organs are relatively rare as compared to the more common electric or pneumatic type. A tracker gives the organist more precise control over the exact moment that air enters the pipes and is more touch sensitive than other types of organs. The Grace Church organ tonal design is eclectic, effectively playing music of all style periods.